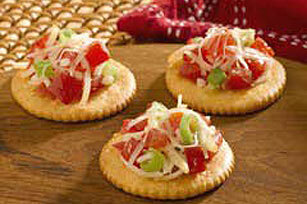 Bruschetta on RITZ Crackers! As simple as they are to make, these tasty appetizers are guaranteed crowd-pleasers. Place crackers on baking sheet; top with tomato mixture and Parmesan cheese. Bake 8 to 10 min. or until cheese is melted. Serve warm. Make this tasty cracker topping ahead of time to allow the flavors to blend together. Store in tightly covered container in refrigerator up to 24 hours before using as directed.